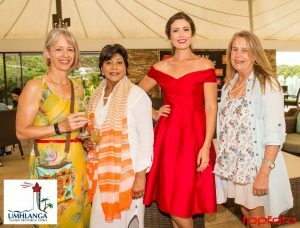 The Umhlanga Summer Festival 2018 was launched this week at the beautifully decorated Cabana Beach Resort conference room. Invited guests were treated to talking, music, dancing, singing and modelling – all by locals. 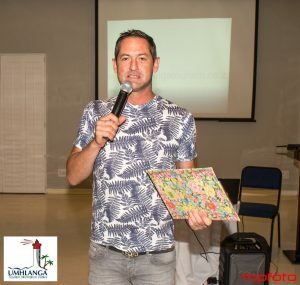 Umhlanga Tourism is a Community Tourist Association and as such supports initiatives, creatives and organisations in our own back yard and the 2018 summer festival is a strong reflection of this. Durban Youth Radio DJ, Kevin Minter-Brown, compered proceedings. The community radio station, which has grown from 12 000 listeners to 256 000 in a short time, will be highlighting the festival during the December period. Girls & Boys Town from nearby Verulam was also represented at the launch. Girls & Boys Town cares for vulnerable teenagers and elements of the Umhlanga Tourism Festival will be used to support this important community centre. summer, which characterises this time of year in the southern hemisphere, it really is crazy that many Christmas traditions remain those of the northern hemisphere. Haylea has addressed this dilemma by writing her own Durban-based Christmas song – Feels Like Christmas. Haylea will be performing her song and more at Umhlanga Tourism’s ever-popular Carols Under the Stars evening on 20 December. Hooray for home-grown traditions and culture! 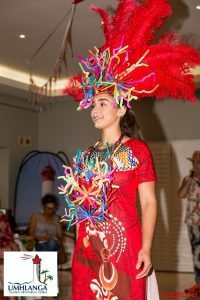 A stunning ‘last straw’ necklace and headpiece, designed by local stylist Gareth Greaves, was also featured at the launch. Looking like coral, the design was used to represent Umhlanga Tourism’s important theme for this year’s festival: It’s Cool to Care – about the planet. For some time now Umhlanga Tourism has supported ‘the last straw’ campaign and the reduction of single-use plastic. The theme, this necklace and headpiece and our theme for this year’s festival continue the important fight against polluting our planet, and particularly our beaches. In fact, the straws available for guests to sip their cocktails through at the launch, were the non-plastic kind sponsored by local company, Chempac. Here’s to a Summer Festival in which Umhlanga Tourism shows it really is Cool to Care about Community! Umhlanga Tourism Summer Festival: 14 to 23 December, 10am to 2pm daily. Carols Under the Stars: Granada Centr,: 20 December at 6pm. Miss Umhlanga Beauty Pageant: 17 December. Registration at 10.30am (no late entries). Competition 12pm to 2pm, winner crowned on the day. Waitronathon: 23 December, 10am registration, race at 10.45am.